What is the difference between ScriptableObject and Monobehaviour class? What are Pros and Cons of Scriptableobject? "ScriptableObject is a class you can derive from if you want to create objects that don't need to be attached to game objects." Don’t worry, if you didn’t get it. Here, I will Explain what it means. As we know, with Unity, everything is an Object. Monobehaviours are one of the Objects. GameObjects: In your scene, you can move around with transform. ScriptableObject is a kind of Object but, it can only Contain Data. So, they don’t get involved in the actual game. I hope you understood the definition of ScriptableObject. Let's discuss Pros and Cons of ScriptableObject. They’re very well maintained by Unity. You can interact with them very easily in Unity inspector. You can create it as a mini file inside your project. You can update that and save that as per your game requirements. If you change something during runtime it will actually remember that. When you are trying to get the data during run time of the game, you don’t worry about parsing external files which will come into play more. You can save millions of integers inside of a ScriptableObject. So, there’s a lot of space(no size limit function). As you’re building a scriptable object and create few instances of it and realize ,ohh I need a new setting for ‘moveSpeed’ or whatever additional variable you need you can add, it won’t disrupt your variable. Deleting variable can have a little bit negative impact. If you want to make assets out of scripting then you have to know a little bit about it. If you’re working strictly with Unity that’s not really a huge issue. But if you have like team base solution, where you want to send files to someone and have them edit then it won’t work. Can’t save during runtime,once you’ve built the game meaning that this is not solution for saving a player’s data.This is only for saving game development data. 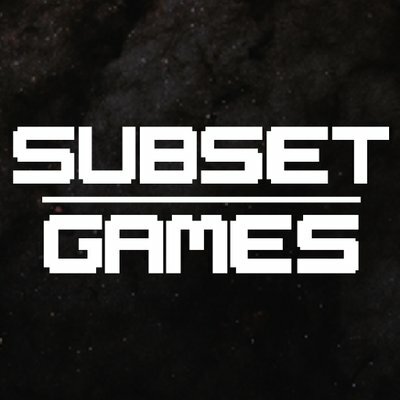 Let's take one example to understand how to use ScriptableObject in game. Let me give you one task first. Suppose, we have 10 level game and at each level the behaviour of enemy will change. Any Ideas, how you will do this?? Ahh, You might think that make 10 prefab of 10 different enemy and assign it to each level. Right?? Are you sure, it really a good practise? "Because one enemy object may have 4 variable and Update() function with it, and suppose is uses 4 Mb of memory, so 10 level enemy may require 40 Mb of memory amount." So, here is the solution. 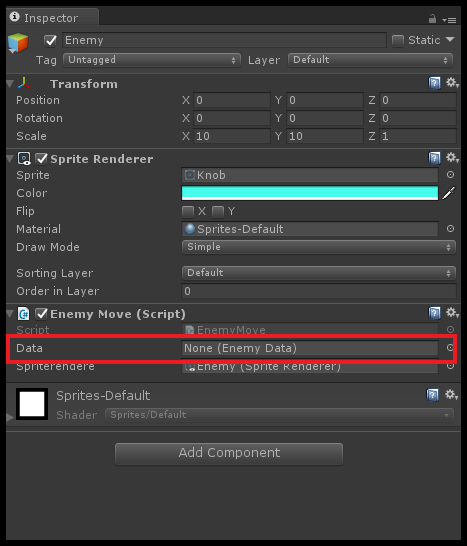 Use ScriptableObject to store data of enemy Object. Let’s, develop our mini game with ScriptableObject. 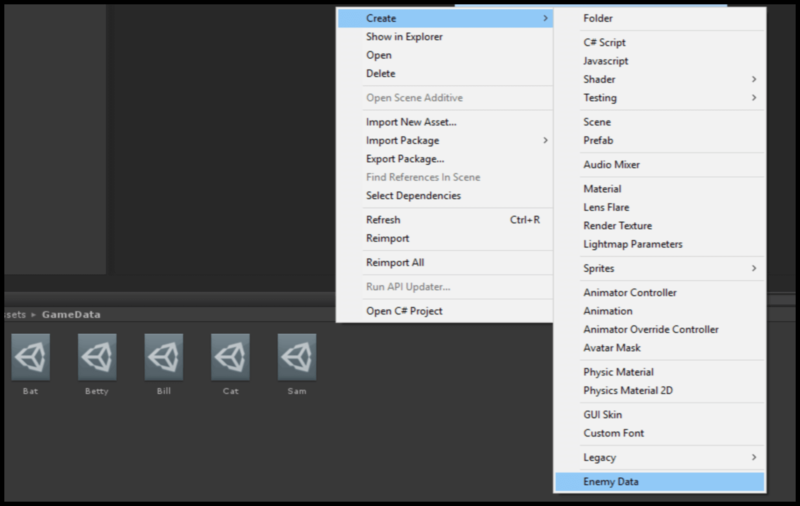 Create an empty GameObject name it Enemy. 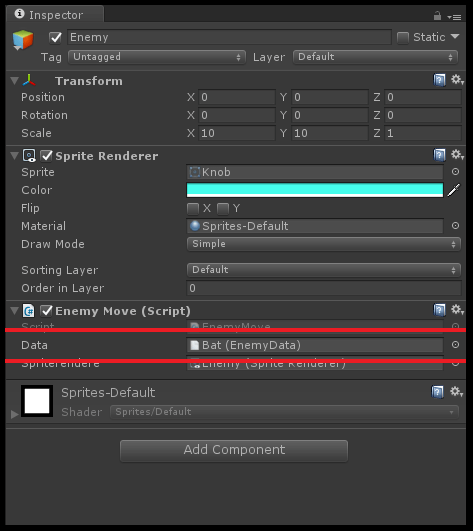 Assign it to empty GameObject(Enemy). EnemyMove script has three public variables. If game has so many enemy GameObject with enemyMove script with it then uses lots of memory. For that as per our solution ScriptableObject, we can make a EnemyData script Instead of storing these variable within EnemyMove script. Create C# script name it EnemyData. which inherits ScriptableObject instead of Monobehaviour. Write the following code in EnemyData.cs. Change the code inside ‘EnemyMove’,which was previously created. Create One public variable ‘data’ which is the reference of ‘EnemyData’. Change according to following code. Any idea..what you suppose assign over here?? Name it as you like. 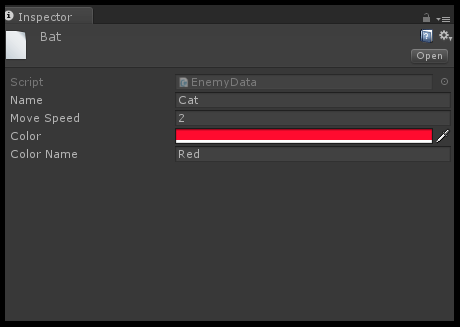 Now, you can see all the variable inside the EnemyData in inspector window, you can change values of variable here. I am sure you got all the answers now. ScriptableObject are really good for the fact that they can break your data into more sizeable chunks. So that you’re not eating up a lot of memory. ScriptableObject is only for development purpose.